We went to Hangzhou as it was recommended for its sightseeing around West Lake, a UNESCO World Heritage site. It is a growing technology hub and home to Alibaba. As we arrived by train from Shanghai we were we surprised. We expected a town. This was another massive city, with its high speed railway station miles out of town. Hangzhou is ever expanding with new area after new area, new buildings after new buildings!! A dynamic growing metro system with 7 lines built and 6 to go makes this a very easy city to get around. The trains were new, efficient and the metro system was very easy to follow. Although we had a reasonable idea of where we should get off the train we got off a station too early. This resulted in quite a long walk getting to the lake. Here we joined the tens of thousands of visitors wandering around, hiking, taking ferries, riding bicycles … a never ending flow of humanity. Loud brash and generally inconsiderate, spitting, noisy throat clearing and coughing and spluttering don’t make for a quiet Sunday outing! Many wandered around with their focus intent on their mobile phones. 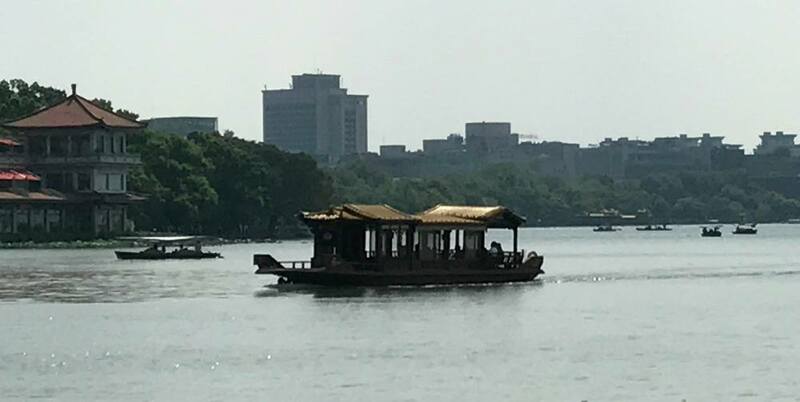 We took a boat trip on the lake and apart from the jostling crowds enjoyed our Sunday outing with the locals in Hangzhou. Chinese big cities are just like any other big cities - concrete, steel and pollution. Building bureaucracies feeding off each other in a corrupt and inefficient loop. The society has a strong focus on anything western … the clothes, the brands and the look. Their own culture being gobbled up by ferocious western values. Constructing buildings, roads and railway systems does not build sustainable wealth. One hopes that somehow the Chinese leadership can find a peaceful solution to the monster they have built. When arriving at a metro station the first step is to get a current map or to take a photograph of the latest map of available lines and stations. It is also very helpful when trying to remember at which station to get off as many have similar names. Sightseeing at a popular local attraction on a Sunday should be avoided.